As of the 6th June 2017 we have begun to impose file usage limits on our Shared and Reseller servers. This means that each cPanel account will be able to store a maximum of 200,000 files and folders. Whilst we appreciate that this may be an unpopular move, it's a step that we've had to take to keep our Shared and Reseller servers running optimally for the majority of customers. Over the past few months we have seen a very small percentage of customers (less than 1%) using Shared Hosting accounts to store a huge number of files and this was causing adverse file system performance and also caused a huge drop in performance of our backup systems when both backing up and restoring data. As such, we have fallen in line with the rest of the industry and placed a maximum limit on the number of files and folders that can be hosted under a cPanel account. We should stress that the limit we've set isn't designed to punish you, or catch you out in any way, it's simply a measure that we've had to take to keep our systems up and running as smoothly as possible. We've found that the average hosting account uses less than 30,000 files and only a tiny percentage of accounts that we host are anywhere near the 200,000 limit. If you do go over the 200,000 limit, an email will be sent to you notifying you of this. The system will then give you 7 days to bring your file usage back to within the limits. During these 7 days your account will continue to function as normal without any restrictions. If after 7 days you are still over the maximum file usage limit, then a hard limit will automatically be imposed and you would no longer be able to write any data to the servers disk. If you do find that your hosting account has already gone over the limit, here is what you can do to reduce your file usage. If you find you have already gone over that limit then you can choose to either reduce the file usage on the account, or move to a more suitable hosting plan. If you would like to reduce the file usage on your account please read on for some tips on how to do this. 1. 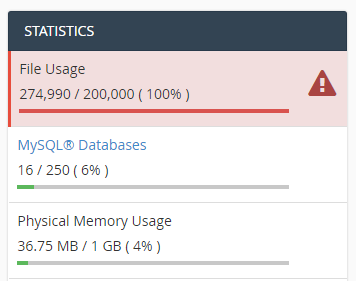 Log into cPanel and click on the "Disk Usage" icon. 2. You will then be presented with an overview of the disk usage of each directory under your webspace. Unfortunately the data only shows us the disk usage in MB / GB and not the file usage count of each directory, but we can usually use this data to get a good idea of what's causing a high file usage count. 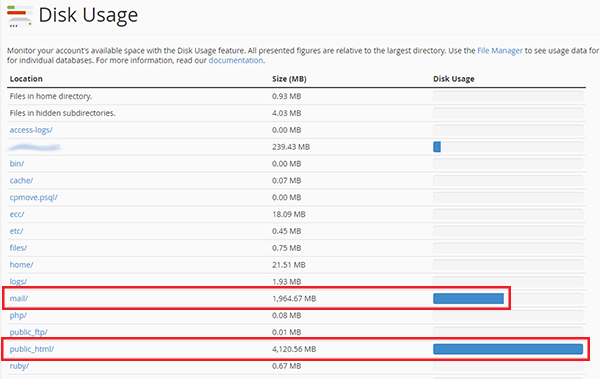 In the example below, we can see that the two main directories with a high disk usage value are the public_html and mail directories, so we can safely assume that there are a lot of files in each of these directories. 3. In our experience, the mail directory is much more likely to contain a large number of files (each email stored on the server is 1 file) than the public_html directory so we would recommend examining the file usage of your email accounts. To do this go back to the cPanel home page and click on the "Email Disk Usage" icon. If you have a large number of mail accounts then this page may take a while to load so please be patient. 4. Once the page has loaded, you will be able to see an overview of how many emails (files) are stored in each of your mailboxes. In the example below you can see that the "Trash" folder of the default email account contains a huge number of emails, all of which are counting towards the total file count of the account. 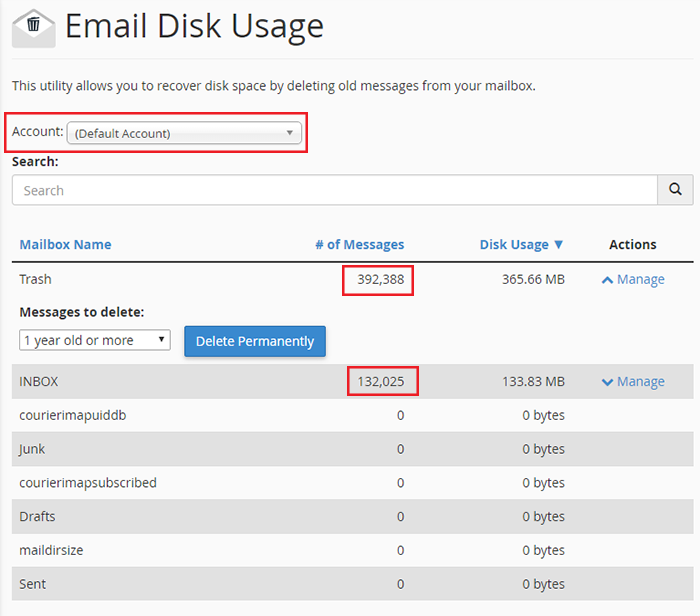 If you find a mailbox with a large number of mails that can be deleted, click on the "Manage" link to the right of the mailbox and you can then choose to either delete all emails in the mailbox, only emails older than 1 year or a custom query. If you have a number of mailboxes, please ensure you go through each mailbox and check the file usage on each of them. You can view all of your different email accounts by using the drop down menu near the top of the "Email Disk Usage" page as shown in the image above. Top Tip: We find that the most common cause of high file counts is the default mail account. By default the default mail account will receive cron job notification emails and clients tend to forget about this mailbox and just leave it to fill up, so emptying the default mailbox is usually the easiest way to dramatically reduce the file count. You can empty it either by using the method shown above, or by using the cPanel file manager to delete the /mail/cur and /mail/new directories. 5. If you find that you don't actually have a lot of emails stored on the server then your high file usage count is likely coming from your public_html directory, in which case you need to go back to the "Disk Usage" page in cPanel and navigate through the directories until you find one with a high file count.